Kratie, Cambodia — One hundred miles northeast of the capital city of Phnom Pehn, scientists from Conservation International (CI) have partnered with local Buddhist monks from the 100 Pillar Pagoda and the Fisheries Administration (FiA), in a grand-opening ceremony for the Mekong Turtle Conservation Centre (MTCC), releasing more than 50 Cantor’s soft shell turtle adults and hatchlings into a protected conservation pond. 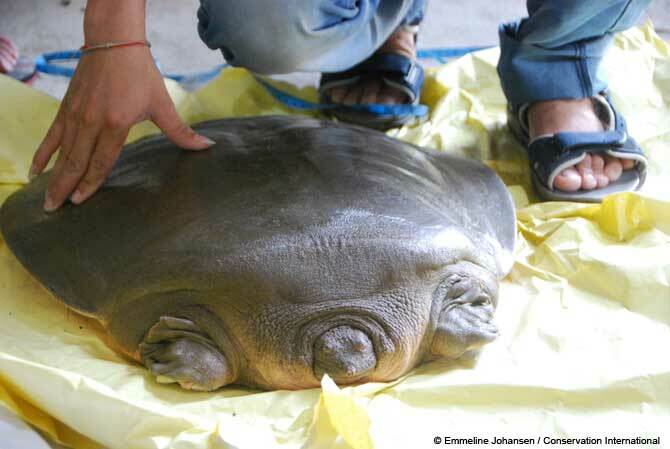 The goal of the Mekong Turtle Conservation Centre (MTCC) is the long-term sustainable conservation of the wild population of one of the world’s rarest and largest fresh water turtles — the Cantor’s soft shell turtle, (Pelochelys cantorii) of which the largest known wild population survives in the nearby Mekong River. Read the full story from Conservation International. Since June of this year, the Mekong Turtle Conservation Centre has been open to visitors daily, for a small entrance fee. Another good reason to visit Kratie and Cambodia’s north east region. Thank you for any other informative website. Where else may just I get that kind of information written in such a perfect means? I have a project that I am just now running on, and I’ve been at the look out for such info.